Apocalypse is Drayton Manor’s tallest ride, and its huge tower is visible for miles around. After being taken slowly to the top, riders are drop 54 metres back to the ground below in 4 seconds. 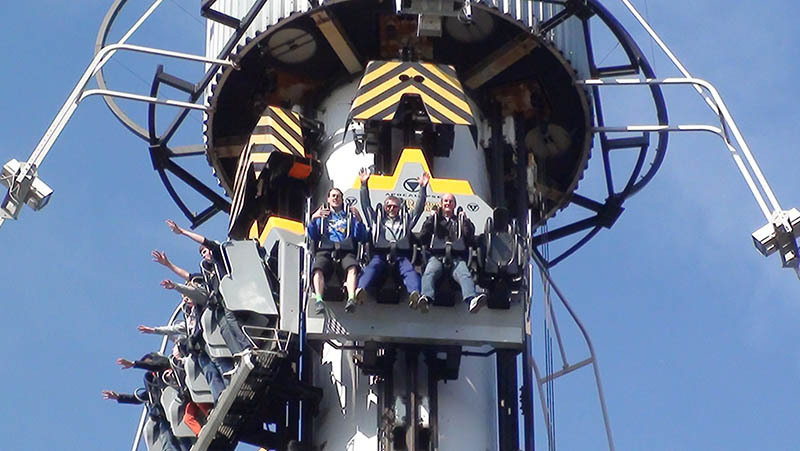 There are three types of experience on offer: the standard style sitting drop tower; standing up on a small platform for the duration of the ride; or stand up floorless, with nothing beneath the rider’s feet. For the stand up and stand up floorless experiences, the gondolas tilt 15 degrees forwards as they rise up the tower, leaving riders in no doubt about just how high up they are travelling. No wonder then, that Apocalypse has been described as Britain’s scariest ride.